Diva Moments at Broad Street United Methodist Church in Burlington on 2019-03-23 -- Nobody covers the arts throughout the Garden State like New Jersey Stage! (Burlington, NJ) – Bridge Players Theatre Company, a community theatre in residence at the Broad Street United Methodist Church in Burlington, is presenting a fundraiser, “Diva Moments.” The show is an hour and a half of entertainment, featuring thrilling, show-stopping songs from the canon of Broadway musicals. This highly anticipated, one-night-only performance will feature members of the Bridge Players Theatre family of performers past and present. The event will be held at 7:30 pm on Saturday, March 23, 2019, at the Broad Street United Methodist Church, 36 E. Broad Street in Burlington. Doors open at 6:30 pm and the evening will include a Tricky Tray auction and a post-performance reception. All proceeds will go toward future productions. 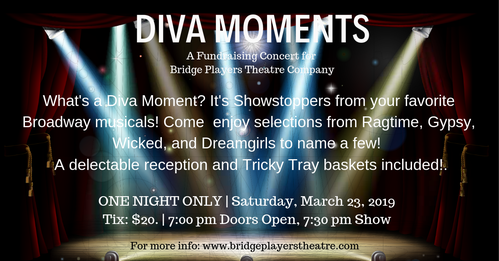 Bridge Players has assembled an array of talent for Diva Moments, including some favorite actors who have appeared on the Bridge Players stage over the group’s history, along with some young fresh faces that have recently worked with the company. All tickets are $20 and can be purchased by calling the Box office at 856-303-7620. Visa, MasterCard, American Express and Discover are accepted. Tickets may also be purchased online; additional information is available at www.bridgeplayerstheatre.com. Bridge Players will end its 2018 - 2019 season with the musical revue, All Night Strut, in May 2019. Bridge Players Theatre Company Closes 43rd Season with THE ALL NIGHT STRUT!